Rainy days call for jeon, or “korean pancakes” (with a side of makgeolli or rice wine). There’s many versions that can be made: kimchi jeon, seafood jeon, chives jeon, scallion jeon and more! 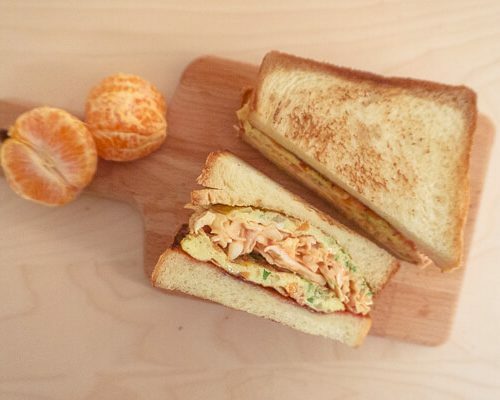 Today we’ll be focusing on the spicy kimchi version that leads to a crispy edge but chewy bite with Baek Jong Won’s secret ingredient of tuna. 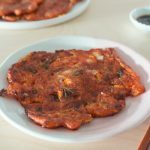 Kimchi pancakes is one of the best ways to whip up a quick meal, particularly on a rainy day and to utilize any abundance of very fermented kimchi that might start to go sour soon. Remember when I said I can’t use recipes that use too much kimchi? Well, a friend’s mom gave us a jar (yay!) and so I have been happily fermenting it to use for a day like this! 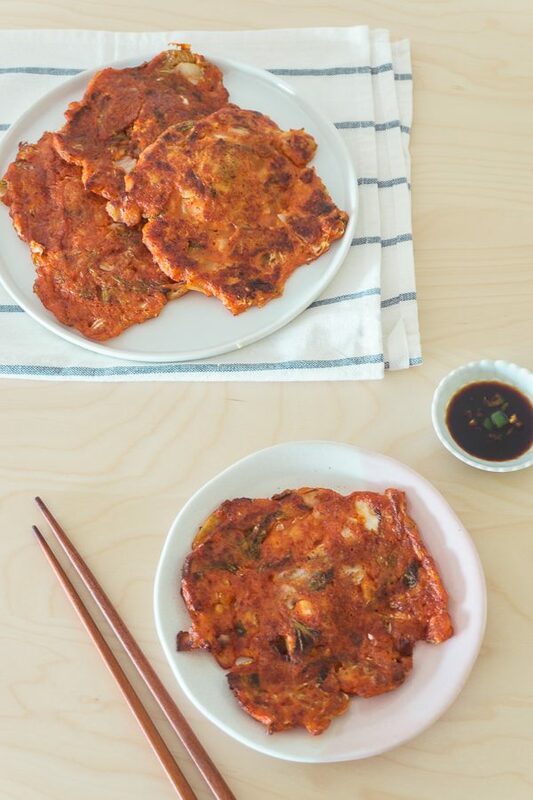 Most kimchi jeon is a concoction of overly fermented kimchi, pancake flour (or regular all-purpose flour), maybe some onion and scallions, and maybe some egg (depending on the recipe!). 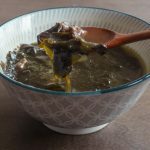 With Baek Jong Won’s recipe, we divert a bit from the standard but it’s really good and a very popular recipe. First the Kimchi: This is standard across all recipes! 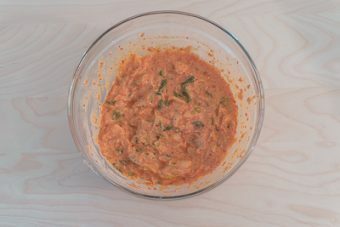 Try to use good well-kimchi i.e. kimchi that was made fresh yesterday might not be your best option just yet. 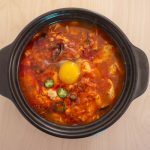 (This is the same for kimchi fried rice or kimchi jjigae). **If it’s too fermented, where its getting too sour, a little bit of sugar will help. If not, no sugar is needed. 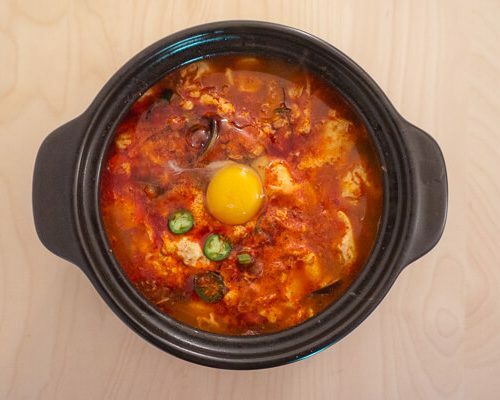 No Egg: Most jeons include egg but Baek Jong Won prefers to exclude it with kimchi jeon specifically as he notes it does not mesh well with the kimchi flavors. 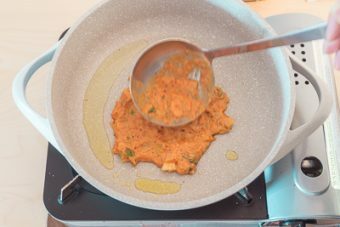 Water Ratio: Baek Jong Won points out that kimchi jeon batter should be thicker than seafood jeon or other jeon batters. 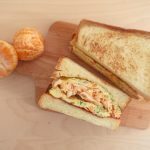 Canned Tuna: This is an optional ingredient that Baek Jong Won suggested during his TV Show “Home-Cooking with Baek Jong Won” and it became very popular! It does not make the batter fishy nor will you really taste the tuna at all. Instead, you just have a bit chewier and thicker parts of the batter. Only half way through the meal did DrJuh ask = is this .. tuna? It will just alleviate your jeon! Many Korean homes are often stocked with a few emergency cans in their pantry. 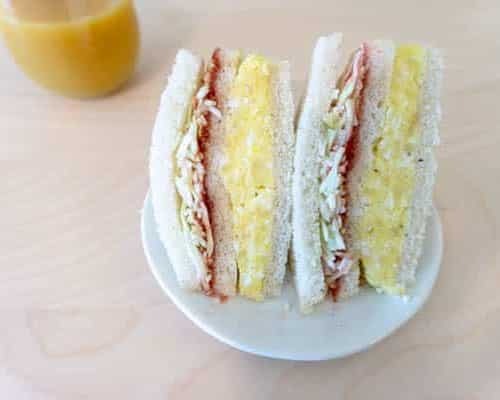 But, if you don’t have this at home, you can definitely skip it and still enjoy. Gochugaru (Korean red chili flakes): Most recipes skip this but just a bit is added to make it look more delicious and a vibrate red! Tip: And, there’s no need to create huge pan-sized jeons. If you’re nervous about flipping, little sizes will help and gives you more outer edges which is the best part. Enjoy with some makgeolli (rice wine) on a rainy day, for a mid-day snack or as a side dish for a easy quick dinner with a bowl of rice! Jeon is best served warm! Just a few clips from the show! because Koreans use scissors for everything! one less thing to wash! 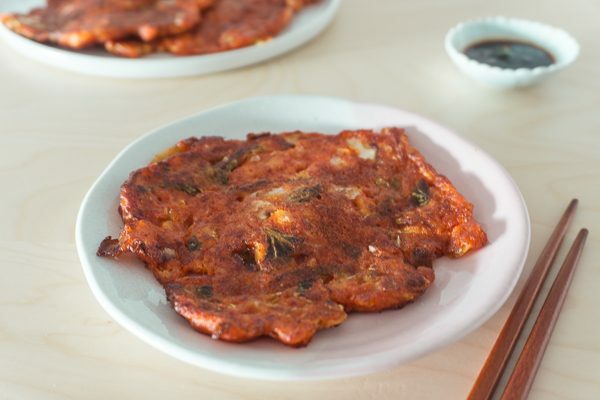 Super easy Korean kimchi pancake with a crispy edge but chewy middle and tips included from Korean celebrity chef Baek Jong Won for the perfect bite. ⅜ (6 Tbsp) cup cold water * I found this to be the best texture but for easier measuring, ½ cup works well too! 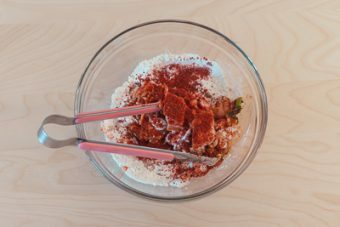 Dump the kimchi into a medium sized bowl and cut the kimchi into bite size pieces. *The Korean way: cut the kimchi in the bowl with scissors! No knife needed. Add the buchimgaru (pancake mix) directly into the kimchi bowl. Add in the Korean red pepper flakes. *Tip: 1) The ratio to kimchi:buchimgaru is 2:1. **Optional: If using the tuna, add it in now. Add in the kimchi juice and cold ice water into the kimchi bowl. Cold water is key here. Combine the ingredients together until incorporated. Do not overmix. Tip: *As noted above, I found ⅜ cup (90 ml) to get the best thick texture but for easier measuring, ½ cup works well too! Heat a fry pan on medium-high heat and drizzle in a few Tbsp of oil. Make sure the frypan is well heated and the oil can swirl around in the pan before you add in the batter. Pour a ladle of batter into the pan and help spread it thinly into a circular shape. Cook the jeon until it is nicely browned on one side - about 3 minutes. 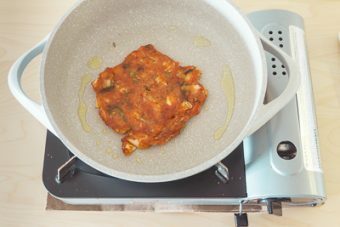 Flip it over and lightly press down on the jeon with the spatula. Cook for another 2-3 minutes until golden. You can flip another 1-2 more times if desired. **You want the jeon to almost fry in the beginning to get it nice and crisp. 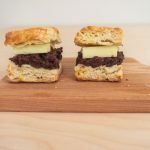 If desired, serve with a small dipping sauce of soy sauce and Korean chili flakes. Enjoy with a bowl of rice and soup or as a snack with some rice wine! Serve warm. 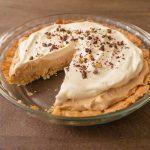 **Cold water that lends to cold batter is key! Between batches of making the jeon, if your batter gets warm, stick it in the fridge. **If you don’t have buchimgaru, you can use all-purpose flour and you will still have yummy pancakes! Note that buchimgaru will yield a slightly more crispy edge and will be seasoned. 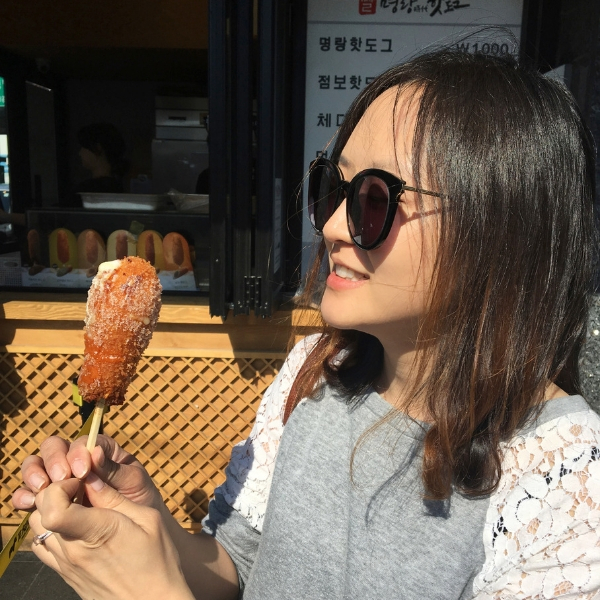 It already includes a mix of flour, potato starch, salt, baking powder etc and is a staple in many Korean homes. **For even crispier jeon, you can replace about 1/4th of the Korean pancake mix (buchimgaru) with Korean Frying Mix (twigim garu).